The NHL Draft is tonight, but the Chicago Blackhawks didn’t wait to make some blockbuster trades today. The Chicago Blackhawks traded two core pieces today in Niklas Hjalmarsson and Artemi Panarin. 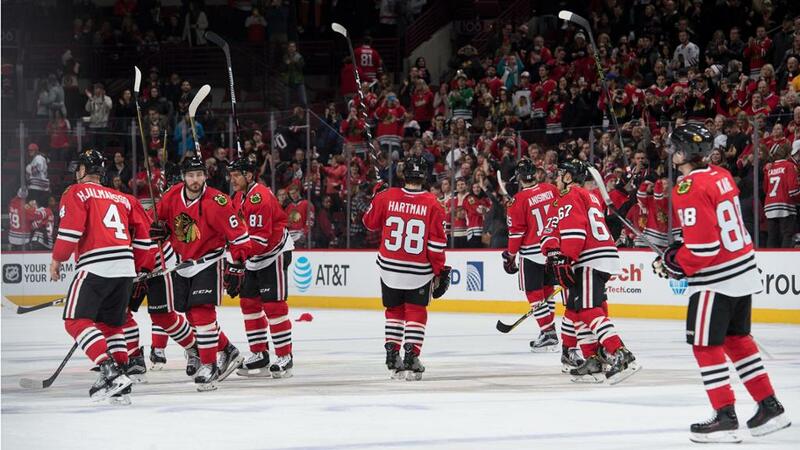 It seems like every year the Blackhawks run into cap problems. Having Jonathan Toews and Patrick Kane combining for $21 million of the $75 million cap space is costly. This deal makes total sense for Chicago. They need to shed off some salary and that’s what they did. Hjalmarsson will be a free agent in two years and could be looking for a pay raise, which Chicago just can’t afford to do. Getting a young promising defenseman who is already locked up in a reasonable deal really helps Chicago with their cap problems. Connor Murphy put up 17 points (2 goals and 15 assists) last season, but it’s his defensive side that he is used for. Yes, he was a minus 13 last season, but that was on a poor team in Arizona. Overall he may not be a top 2 defensemen of the future, but if he is able to be a solid top four then this deal works out in spades for Chicago. Chicago is also receiving prospect Laurent Dauphin who put up 27 points (17 goals and 10 assists) in 38 games in the AHL. In 34 games in the NHL, he has only mustered 4 points. With Marian Hossa being rumored to retiring due to skin disorder from his hockey equipment, that opens up a slot on the roster. Laurent Dauphin hasn’t proved he can play at the NHL level, but his successful AHL season last year shows he might finally be ready to make some noise in the NHL. I have mixed emotions from Arizona’s side of the deal. The idea of having Niklas Hjalmarsson and Oliver Ekman-Larsson on the same team makes me excited. They can compliment each other very well since Hjalmarsson is a more defensive type defensemen while Ekman-Larsson is more of offensive defensemen. The only problem I have with this deal is that it’s a big risk. Hjalmarsson is only two years away from free agency. If Arizona can’t turn it around and compete within these two years then there is a good chance Hjalmarsson might just look elsewhere. The benefit for Arizona is that they have a lot of cap space so they could easily afford what Hjalmarsson is looking for, but what I am afraid of is Arizona paying an overkill amount for a long-term deal that will hurt them down the road. Now Laurent Dauphin is a promising player, but Arizona does have a lot of young forwards. Also having 4 picks in the first 3 rounds of the 2017 NHL Draft definitely helps refill any vacant positions needed. Laurent Dauphin is a player that is hard to tell whether he will be something or not, but Arizona better hopes not, because this can be a deal that bites them in the future. At first glance, this is an awful trade. Artemi Panarin put up 74 points (31 goals and 43 assists) last season. Overall he has 151 points in 162 games in his two-year NHL career. Maybe Chicago believes he is only doing so well because of who he is playing with, or maybe they expect him to ask for a $10 million contract that they can’t afford. There is understanding for them moving him due to cap problems, but it’s only getting Brandon Saad in return that is the killer. Brandon Saad put up 53 points (24 goals and 29 assists) last season. Sure, Brandon Saad has helped Chicago win cups in the past, but I wouldn’t say he is worth it over Artemi Panarin. Now at second glace, this is still an awful trade. Getting a young offensively skilled player in Artemi Panarin to join a fairly young and rising team Columbus while only really giving up Brandon Saad, well, all I can say is bravo. Bravo Columbus. Every year Chicago runs into the same problem over and over. Instead of moving the player who truly causes this problem they seem to trade everyone else. The player Chicago needs to deal away is Jonathan Toews. Yes, Captain Serious. he does bring a good amount of leadership and plays quality defense while racking up 50ish points a season, but he is not worth $10.5 million in my eyes. Even if he is, I’d much rather have two great players opposed to one. I don’t see Chicago pulling off this move, so as every year goes by expect Chicago to keep trading pieces that they frankly should hold onto. 22-year-old aspiring sports journalist. Knowledgeable in most sports, but an expert in NHL and NBA.